There is this snobbish notion that my profession and interests are not Real. That conversations via email, skype and twitter are not real compared to conversations you may have when you meet face to face in physical sense , the term more commonly referred to In Real Life. What is Real Life anyway ? Am I less real and less alive now that I am typing something which you are reading ? Are you less real and less alive because your consuming these words with your mind and collapsing them away into an idea. In social media there is an expectation of transparency of honesty and I might suggest reality. 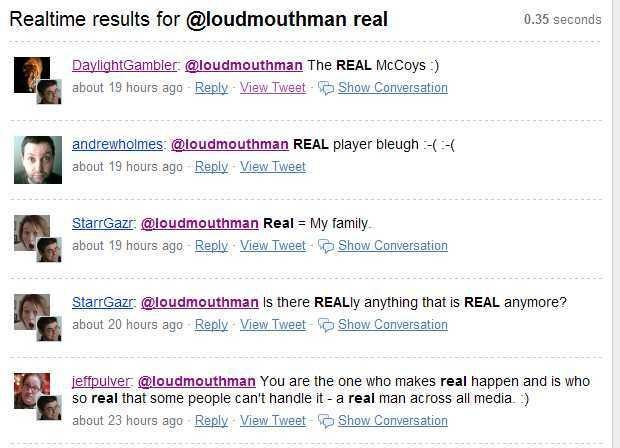 I asked my twitter stream what Real was and what was real to them , here are some of the responses. So whats your opinion on Real ? ← I have the Power ! Pingback: SOB Business Cafe 08-29-08 - Liz Strauss at Successful Blog - Thinking, writing, business ideas . . . You’re only a stranger once.